Millennial business owners are confident in the future of the U.S. economy and the success of their own companies, according to The Business Journals SMB Insights study, which measures how Millennials and Baby Boomers compare. Nine out of ten Millennial business owners are confident they will maintain their current lifestyle throughout retirement and are investing at a rate 29 percent higher than Boomers. Relative to their Boomer peers, Millennial business owners have few worries except when it comes to the environment. Millennial business owners are more concerned about the environment and global warming than Boomers, who respect green values but are less likely to incorporate sustainability into their day-to-day operations. Fifty-one percent of Millennial business owners are making strong commitments to integrate sustainability into their business products and services compared to 41 percent of Boomers. Millennial business owners grew up with technology. They consume business news most frequently via mobile or electronic device citing speed, breadth of resources and convenience as key benefits. Six out of ten prefer shopping on-line versus in-store for their business compared to 48 percent of Boomers. More than one-third of Millennial business owners make investment trades online and 46 percent source new hires from online sources. The Business Journals SMB Insights study is sourced from an extensive annual survey of a nationally representative sample of business owners, C-suite members and top management decision makers. Download a complimentary copy of the complete white paper. To see an infographic of the data, click here. Source: The Business Journals’ SMB Insights whitepaper compares two generations of business owners. Your stage of life is called "Act III" because, in a play, it is the act where all that has gone on before comes to a climax. The people experiencing this stage are "Third Act-ors" (TAs for short). Third Actors are far from done! TAs don't have time to waste on getting approval from others. TAs have experience and wisdom that the world needs and have a burning desire to share it. In ACT III, we assume that everything that has built the character of the TAs is good. Baby Boomers have been shaken, but they have also had an opportunity to review their values. Real character is what Baby Boomers have entering into Act III. We are educated and competitive. We love to learn; we love to achieve. Since our youth, we have wanted to make a difference in the world. We have been seasoned by hardships and challenges. We have learned from the lives of those who have gone before us. We are unlikely to accept "not working" as our only goal. In some cases, to consider anything other than gainful employment is not an option. The definition of success has broadened to more than a monetary standard. We will test the assumptions of aging as we have tested the assumption of every life stage so far. We want our wisdom to make a difference. We want our lives to have purpose. As we transition into Act III, we are not entering "retirement." Many Baby Boomers are faced with a challenge: supporting thirty or more years of active living with an unknown and uncertain picture of their finances. For many boomers, the solution to this challenge is to continue working on a full or part-time basis well into their seventies or eighties. Longer working careers mean that TAs need to find ways to merge pleasure, purpose, and work. In Act III--regardless of how you have viewed work--work now must equal purpose; purpose must equal purpose. Act III is about the time in our life when we can make choices, given the flexibility created by wisdom, lifetime skills, financial foundation, and an acute understanding that now there can be no excuses for not living a life in balance, joy, and purpose. You have already had golden moments of living your dreams. As you recognize your dream moments, you will be able to increase the choices you make in this direction, finding more options in fulfilling your dreams. The technique is "mind mapping." A Baby Boomer, born in 1946, who retired in 2011 can expect to live about 18 to 19 more years; about 25% longer than their parents lived. Men can expect to live to be 82 years old; women to be 84 years old. While it is exciting to consider how these "added" years could be lived, it also creates a financial challenge. Longevity can be great--if you plan for it by asking yourself the question: What should I do with the rest of my life now? Today, there are 22.7 million small to medium sized businesses in the United States. The asset value of these businesses is estimated at over $100 trillion. Among that group of asset owners are twelve million Baby Boomer owners who are hoping to transfer ownership in the next five to ten years. Many owners dread the process of exit planning; they procrastinate or see it as a sign of growing old or going out to pasture. As one owner said, "At least when you die, you don't have to think about what you are going to do the next day." Exit planning makes a powerful difference in a successful ownership transfer, but only 13% of business owners have an exit strategy. Exit Signs by Pamela T. Dennis, PhD is an authoritative source for how to sell and leave a business for those who spent their lives building one. It provides a rich roadmap toward the four goals business owners have when transferring ownership: a profitable sale, pride in leaving a sustainable business, a strong legacy, and a path forward. As more and more Baby Boomers retire, its time for Corporate America to reinvest in its workforce and come up with creative ways to retain the massive amount of knowledge that will retire along with those born between the years of 1946 - 1964. Years ago, employers were told to prepare for the mass exodus of talent and experience as baby boomers retired. (Back then, the biggest worry was that experienced managers would leave for a position at a competing company.) However, thanks to the recession, many Boomers delayed retirement and companies moved on to other issues. Now though, Baby Boomers are moving on to retirement at a steady pace, leaving the market entirely, and companies seem unprepared for their absence. With the average U.S. retirement age at 62 and the youngest boomers turning 51 this year, companies still have time to replenish talent and bridge the gaps in knowledge. To transition talent into the workforce, it's important that companies use high-quality talent-based assessments to identify top performers. By understanding the specific talents of their most successful Baby Boomers, hiring strategies can be created to find candidates with the same talents. Companies can also track the experience of their top performers and look for candidates with similar experience, as well as provide employees with experiences to prepare the younger generations for the future. GenY/Millennials have become a significant portion of the workforce and will constitute 50% of all American employees by 2020. In the next few years, another 40 million Gen Y/Millennials will enter the workforce. The younger cohort is rapidly taking over jobs and positions from the many Baby Boomers pushing 70 years of age. The Millennial generation views themselves as the most wanted by parents and planned generation of all time. These GenY/Millennials are maturing quickly, with the oldest members approaching 35 years of age, and the younger members reaching adolescence. Gen Y/Millennials are the most diverse generation in history—both ethnically and racially. Making up the cohort group are 59.8% White—a record low for a generation, 18.5% are Hispanic, 14.2% are Black, 4.3% are Asian, and 3.2% are mixed race or other. Due to the recent economic recession, Gen Y/Millennials suffer from careers stalled before getting started. The U.S. Department of Labor places the unemployment rate for Gen Y/Millennials at 13.1%, nearly 80% above the national unemployment rate. Another 300,000 are not included in the figure due to already given up looking for jobs. Despite depressing prospects in the job market, record student debt, and the resulting high-stress levels, attitudes remain remarkably positive. Compared to Boomers who have spent most of career time with one employer, GenY/Millennials are not the same and may prefer multiple job movements, are confident and achievement-oriented, and prefer managers focusing on work as a means to an end. Their work should be meaningful and little wasted time spent on non-value added events such as meetings. GenY/Millennials want to be considered as equals in the workplace and have their contributions noticed. Engagement, skill development, and networking are all tenets stimulating work life. Personal images drive Millennial cohorts' thinking and they can be vocal concerning personal progress as evidence of high enthusiasm for success. Perrone-McGovern, Wright, Howell, and Barnum (2014) conducted comprehensive interviews with Millennial employees between the ages of 18 and 32. Their discovery was most men and women from this group desired to avoid extremes in spending too much time at either work or home. According to a recent MoneyRates.com study of 2,000 adults, about 85% say the door is open to adult kids who move back home for financial reasons. Additionally, the Pew Research Center found that 36% of all 18- to 31-year-olds were living at home in 2012. While parents may feel it is always their responsibility to care for their children, doing so may be at the risk of their own financial security. This is especially the case when parents take out additional loans for their kids, overpay on expenses in order to accommodate another mouth to feed, and using retirement funds to help support their kids. The financial media has recently featured stories with an upbeat outlook for the U.S. economy. For example: The economy is on track for "the fastest growth in a decade" (Associated Press), and "Experts expect jobs aplenty in '15" (USA Today). This upbeat tone is related to December's U.S. jobless rate of 5.6%, its lowest since June 2008. But Jim Clifton, Chairman and CEO of Gallup, offers a different perspective on the jobs data. His February 3 article on Gallup's website was headlined, "The Big Lie: 5.6% Unemployment." Right now, we're hearing much celebrating from the media, the White House and Wall Street about how unemployment is "down" to 5.6%. The cheerleading for this number is deafening. If you perform a minimum of one hour of work in a week and are paid at least $20 ... you're not officially counted as unemployed ... . If you ... are working 10 hours part time because it is all you can find ... the government doesn't count you in the 5.6%. There's no other way to say this. The official unemployment rate ... amounts to a Big Lie. A Federal Reserve chart shows that the civilian labor force has been shrinking for 15 years. 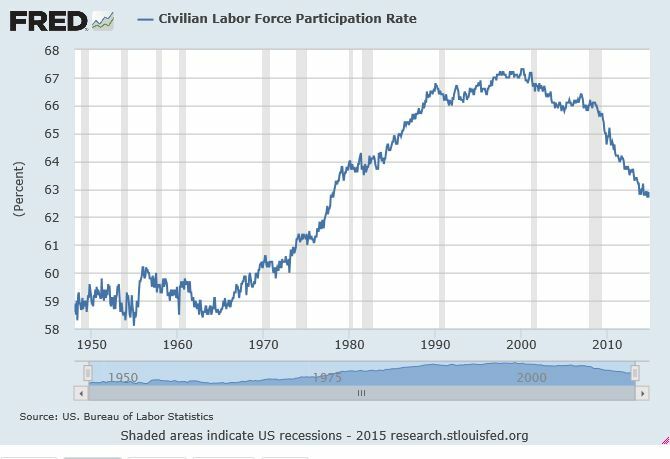 Why is [the U.S. Labor Force Participation Rate] falling when job growth is rising? The answer, we think, is the emerging force of deflation. Notice that the peak participation rate of 67.3% came from January to March 2000, as the major stock indexes topped, after which inflation first began to falter. When stocks rallied to their 2007 top, there was a mild bounce in the rate, but the latest stock market rally failed to generate any sustained rise in the rate of work force participation. Workers appear so discouraged that the pool of available employees is back to where it was in 1978. The opening chapter of Conquer the Crash ...states, "The persistent deceleration in the U.S. economy is vitally important, because it portends a major reversal from economic expansion to economic contraction." What will the jobless picture look like at the bottom of an economic contraction? The true unemployment rate in the U.S. and in most countries around the world will rise and eventually exceed 25 percent ... . 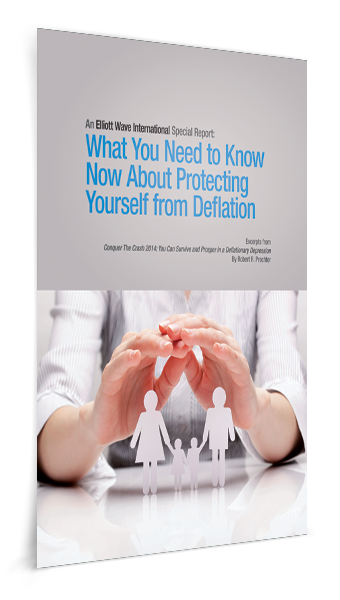 In this free Special Report, you will learn about this unexpected but imminent risk to your portfolio AND you'll get 29 specific forecasts for stocks, real estate, gold, cultural trends -- and more (excerpted from Prechter's New York Times bestseller Conquer the Crash -- You Can Survive and Prosper in a Deflationary Depression). This article was syndicated by Elliott Wave International and was originally published under the headline The "Big Lie" About the U.S. Jobs Picture. EWI is the world's largest market forecasting firm. Its staff of full-time analysts led by Chartered Market Technician Robert Prechter provides 24-hour-a-day market analysis to institutional and private investors around the world.